is the largest triumphal arch in the world and it sits in one of the most devilish traffic junctions in the world. The Arc may look ancient and distinguished but in European terms it’s actually quite young. Emperor Napoleon commissioned the work so that his troops could “return home beneath triumphal arches,” but the work wasn’t finished until 1836. As it turns out, there’s more to see at the Arc than just the traffic or the engravings. The Arc de Triomphe has become a memorial to those lost in battle, from officers of France’s Imperial Army, to more recent conflicts in Korea. An eternal flame burns over the Tomb of the Unknown Soldier from World War One, a symbol of remembrance for all those who cannot be identified. It’s a hefty climb to the 50 metre high summit of the Arc de Triomphe (although those with young children or wheelchairs can take the lift.) From the top, however, the vision in the layout of Paris becomes clear. You can see straight down the Champs-Elysées to Place de la Concorde in one direction and straight to the modern arch La Defense in the other. You can see the creamy curves of the Sacré-Coeur on the hills of Montmartre. Sadly, a visit to the arch is not cheap and you’ll often have to queue to buy tickets. Entry includes a museum, housed in the upper portion of the Arc, that illustrates its history: triumphant Imperial processions, the invasion of the Nazis and the subsequent visits from US presidents. 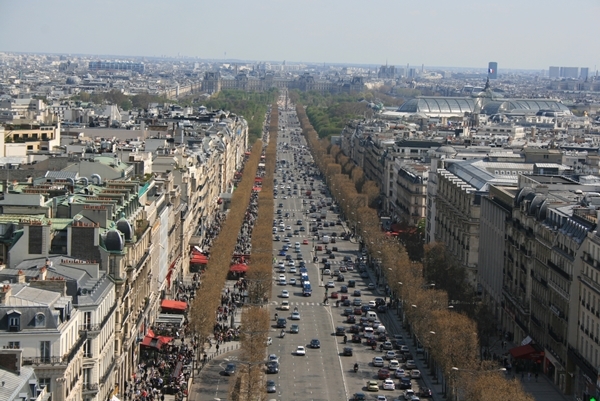 To see the Arc de Triomphe, head to Charles de Gaulle Étoile on the Paris Metro.